This movie will easily find it’s place on the shelf next to ‘Rudy’ and ‘Brian’s Song’. The kid that plays Aaron is sort of adorable! I always knew that Brandon Burlsworth was a special guy in a lot of ways (both on and off the field) because I had heard from many people that knew him and played with him. Having been a lifelong fan of the Indianapolis Colts you can just imagine how proud we were when one of our beloved Razorbacks had been selected in the draft to play for them. Of course, many of you are already aware of the tragedy that soon followed when we lost Brandon in a traffic accident. Horrible just doesn’t seem like an adequate word, but it’s the best I can come up with. 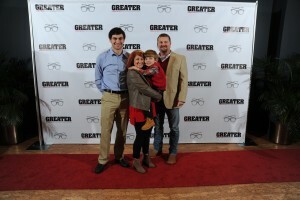 My wife and I had the opportunity to attend the world premier of the movie, ‘GREATER’, with Spencer this past week and see the movie before the rest of the world. 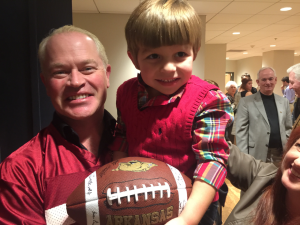 Not only did we get to see the movie but we also got to share the red carpet briefly with the actors in the movie, Neal McDonough, Leslie Easterbrook, Chris Severio, and even the real life Burlsworth family. It was an honor that I can’t put into words. We have made a lot of friends during this process and the entire experience was incredible. I can remember meeting Brian Riendl (the guy that financed, produced, and made this movie his entire life for the past eleven years) while we were shooting one day in Farmington, Arkansas and not knowing who he was until he introduced himself. I just assumed this guy was from Hollywood and had heard the story from someone and headed to Arkansas to make a movie. I had no idea that he was an Arkansas guy, successful businessman, and he bled Razorback Red like the rest of us. I found all of this out later, the biggest shock was that he had never made a movie before. That concerned me. I can remember looking around the room one day and there was a plethora of actors I’d seen in movies and on television and thinking to myself this is going to be very expensive, I sure hope they don’t bust the budget and this thing sits in a can somewhere, haha. I can laugh about it now! I wasn’t alone in this, Leslie Easterbrook shared with us at the premier that she was concerned about production as well once she found out that Brian was going to do it himself. Needless to say, we have egg on our face! Big time. There’s an artistic slant to this film that didn’t take away from the message, and in fact it enhanced it. The way that it plays with the chronology and timeline of events keeps you engaged throughout the film. I’ve rarely seen films that were able to do that successfully (for me anyway, I have ADHD). Unfortunately you won’t just need kleenex at the end of the movie, you will need them throughout, but prepare to share in not only the tragedy, but also a lot of triumph, joy, and perseverance. Chris Severio, who plays Brandon in the film, nailed the role. When I met him shooting hoops in the gym at Farmington I told my wife I wasn’t sure how it was going to play out, he’d been in some films before but the eyes of the state of Arkansas were going to be on that boy and he had some big shoes to fill. Again, I’ve got egg on my face! I have a feeling Chris is going to become a household name once ‘GREATER’ is released. I also can’t say enough nice things about Neal McDonough. He spotted us at the premier and immediately recognized Spencer (who has grown tremendously over the past two years). Before I knew it he had picked Spencer up and was holding him as we caught up. As a side note about Neal that’s totally unrelated to the movie, I admire this guy and the way that he loves his family (and is not afraid to give credit to his wife a half dozen times in a matter of minutes). He has 5 children and a very successful career, I can’t imagine how awesome of a father he must be. When they picked him to play the role of Marty Burlsworth (another classy guy) they hit a home run! I wouldn’t be surprised to see him at least nominated for and winning some awards for his role of Marty, Brandon’s older brother (17 years older) that everyone thought was Brandon’s father. At the core of the Burlsworth family is Mrs. Barbara. We’ve had the pleasure to meet her a few times and she is one of the most elegant ladies you will ever meet in your life. They had no choice but to pick someone like Leslie Easterbrook to play her part because those were also some big shoes to fill. I can tell you this, Leslie nailed the role. I’m not going to give away any scenes from the movie but there are multiple points that you just want to throw your arms around her and give her a hug because your heart is literally breaking with her. There are also points where her gentle words and assurances of faith will pick you up and carry you throughout the rest of the film. During the question and answer session following the premier of the film Leslie shared what it was like to play Barbara Burlsworth and I wish that they would have recorded her response, it was just as awesome as the film itself, almost had Donna and I in tears! There were a lot of other actors in the movie that nailed their roles. Wayne Duvall was good (he really liked Spencer a lot), and Nic Searcy will get you pretty fired up. There are just too many people that worked so hard on the film to mention but trust me when I tell you this, you have to go see the movie. Plan on taking some kleenex. Also, take your family, especially your children. Brandon sets an example for all of us to learn from and ultimately it’s going to change lives! I’m not a professional movie review person, I don’t even go see that many movies —so take this as an amateurs review but it’s a 5-Star film in my opinion. I can’t wait for you all to see it. Our local newspaper in Conway did a review of the film also, you might enjoy it too! I also have some photos from the event, click here!